Jim Madasamy, 67, founding member of Blues Gang, is suffering from primary progressive aphasia, a type of neurological syndrome in which language capabilities progressively become impaired. There is no cure and there is no medication to treat it. What Jim needs is therapy, which might help him improve his ability to communicate and manage his condition. 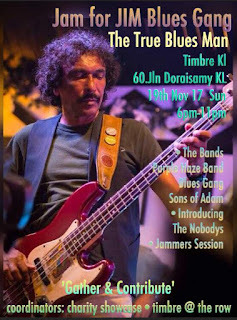 Ganesh, an old buddy from the good old National Press Club days, where Jim used to play once or twice with band members of Blues Gang and also Purple Haze, told me Jim's friends are coming together to raise funds for Jim with their music. They will need an audience. Get well soon, Jim. See you this that Sunday.